There are so many really good, insightful reviews of this book out there already…Check out these enjoyable reviews by Nymeth, Tanabata, and Kay! I have family and friends who still haven’t finished it, so I really don’t want to spoil anything for them, or for anyone that still has this terrific read ahead of them. Dewey has very kindly set up a discussion site so we won’t spoil anything and can discuss the book to our hearts’ content. Thanks, Dewey! I am still processing and thinking about all that happened in this book…perhaps a little overwhelmed! I definitely have what Heather calls “Post Potter Syndrome.” It’s hard to move on from this one to something completely different! I’m also sad that it’s all over…after 10 years…and, yes, I’m also sad about some of the losses that Rowling warned us about before this final book came out. What a great series! It really was a tremendous accomplishment for J. K. Rowling, and as I finished this final volume, I felt a wash of appreciation for such a great reading experience (for children and adults). She did it right. I am so impressed with her imagination, her humor, and her heart. I have also loved the illustrations by Mary GrandPre. Be sure to visit her web site to see more of her artwork and projects. There’s a very nice 13-minute interview with her on the Minnesota Public Radio web site. I enjoyed listening to her talk about her experience with this book and about her process for illustrating them. And, finally, I enjoyed watching the fun video interviews and news features at The Leaky Cauldron! There’s lots to see there, but I particularly enjoyed the interview with Daniel Radcliffe. What a great reading experience for our times! I remember reading the first Harry Potter to my 6th graders, ten years ago, and what a wonderful shared reading experience it was for that class. It’s been so much fun! Thanks so much, Ms. Rowling! This entry was posted in Fantasy, On reading on July 25, 2007 by Robin. I have to agree with you on every point except for the illustrator. It’s a very minor thing, but I did not like her pictures at all. I’m not sure who would have been better, but they just didn’t speak to me. On all other accounts, I echo what you wrote. My post-Potter Syndrome is finally starting to fade. Only took 4 days!! I’m still sad it’s over though. I certainly agree with what you said about Rowling’s imagination, humour and heart! The British editions don’t have illustrations (and I usually love illustrations) but I’d still never be tempted. What a wonderful reading experience indeed! Like you, I have the urge to re-read the whole series, but I think I’m going to wait a few months. And I know all about Post-Potter syndrome. Like tanabata, I’m only just starting to get over it. I loved her note to her daughter Jessica. The “and tidy up your room” at the end made me laugh out loud. She has a great sense of humour. An illustrator’s style would definitely be something that a reader would either like or dislike. Wouldn’t it have been amazing to have Arthur Rackham do the illustrations? They would have had an edge to them, I think. 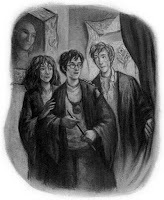 Tanabata, I’m still suffering from post-Potter Syndrome, but I finished a couple of books last week that I haven’t had time to write posts on yet…That should help me with the transition to another book. Thanks for the Tag. I’ll check it out and see what it’s all about. Sounds interesting! I can’t believe Harry’s adventures are over now that I’ve finally read the 7th book. Yeah, this was a great book, I enjoyed reading every page!